Hey guys! Why is that when you try to restrain yourself, life decides to place temptation in your way? Recently, my deal fairies brought to my attention that BH Cosmetics is having another of their super deals for products on orders $25+, I’ll show you the freebies I got as you scroll down. Technically, I was on a self-imposing ban but how can you ignore deals like that. I’m just human! I paid only $38.80 for all these goodies. I’m a happy girl! So yes, for my first purchase, I knew I wanted to try this ever since I missed on Carli’s first Eyeshadow Palette and for $19.50 I’m down with it. I know, I know, ANOTHER Palette I can hear you say. I’ve a sickness I think but just look at this beauty. This is a stunning palette which I’ve really obsessed with recently. I’ve already did a first impression for you guys in my previous post. So, Check out for full reviews of this palette which I’ll link it here. The purple shadow in the middle is a worthy color from this palette. I’ve been digging in to it ever since I got it. Just swipe it on with an eyeliner brush, dab on a little bit of finishing powder to keep the color in place, and go. My second pick is the Studio Pro Total Coverage Concealer in the shade 106 for Light to Medium and with yellow undertones. Available in 15 pale-to-dark shades, in addition to 3 color correctors in pink, yellow, and peach to accommodate all skin tones. I’m pretty thrilled to have this in my makeup bag. I’ve heard many good things about it. From the color swatch which I just did, I could see myself wearing it often or my go-to on days when I’m feeling a little experimental—all at a very forgiving price point. I’ll keep you updated of any new development after I’ve give it a proper test run. The third item I picked is an Eye Curler. Nothing really romantic or fancy about it. It’s just an eye curler but I used it quite religiously. The hot pink color grips scream spring. I really like the girly color. It’s so cute! For a price you can’t beat, I think this is a great eyelash curler and I know for sure that I’ll use it again and again. I’m very happy to get this eye lash curler. I’ve small eyes and it fits my lash line perfectly. I appreciate the soft and comfort grips. Last but not least is Brush #19 which I’ve been wanting to get but didn’t have the reason to, if that make any sense. But since I’ve been reaching out back to gel eyeliner, this brush comes at perfect timing. This short, firm brush allows for controlled and for extremely precise eyeliner application. Now onto the freebies. With any purchase of $25+ you got three FREE items I mentioned above and again on closed up. This is my 3rd Liquid Eyeliner from this brand. I went through a lot of liquid eyeliners and I couldn’t be more happy to get it for free. Seriously. I can’t say enough good things about this liner. It’s long lasting, smudge-proof and gives you a bold and dramatic look in just one stroke. I absolutely love this eyeliner. This is another freebie I got and it’s their NEW Foil Eyes To Go 6-Color Eyeshadow Palette . Available in five different mini 6-color mixes palettes. 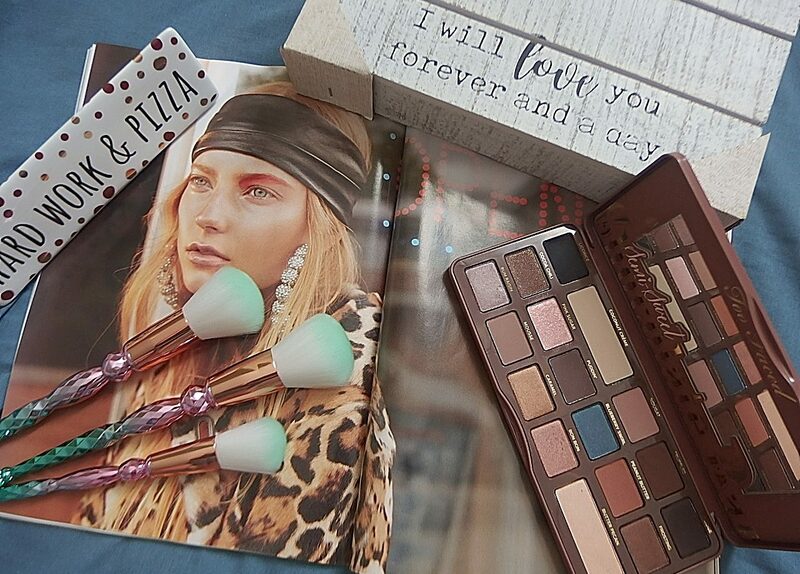 I’ve a collection of three other palettes from this line and so happy to add this to my vanity. Yes, I’m a sucker for eyeshadows! And when it’s free, I’ll take it. The neutral colors look like they can be pigmented or sheered out so I’m really excited to try it out. I’ll do a separate post review and color swatches on all the palettes from this collection. So , don’t forget to stay tuned! The freebies never stop! I’m not complaining either when I received a nice travel Eye Essentials To Go – 4 pieces brush set in my package. It comes with four eye brushes with a good size handle. Since this is a freebie, you might not find this particular set online but they’re the option of 7 pieces and 3 pieces brush to choose from at a very low price. Definitely a nice set to have for short trips. Your eye essential includes a blending brush, eye shader brush, tapered brush and fine liner brush. With summer approaching and several plans to go travelling, I can’t wait to bring this with me in my makeup travel bag. Overall, I love shopping online at bhcosmetics.com because they always have special promo and offer great discounts. All their products are cruelty free in case you’re curious to know. So what are you waiting for, head over to their website and see for yourself. They’re running another special deals as I speak. What other new products do you want me to review next? Comment below. Thanks so much for stopping by the blog. I hope to see you soon on my next post. Bye! Wow, you scored some great products there. I’ve not heard of BH Cosmetics, will have to keep an eye out for them. Gorgeous colors! I need to try these products out! I love that it comes with a brush set. I’m always looking for affordable brushes. I feel like they’re so expensive! $38 seems like a great deal for all of that stuff. And I have a million pallets so no judgement from me!! Ah I love BH Cosmetics but haven’t shopped them in forever! That palette looks beautiful, love everything you got! Omg so many pretty colors!!! I need to get my hands on that eye shadow palette!!! I have always been afraid to try BH Cosmetics…They seem scammy to me. I’ve purchased from them for a couple of years and I can tell that they’re a legit cosmetic company. Interesting choices and love the eye lash curler! It’s always great to find items you really want to buy when you are out looking! The gel eyeliner looks particularly interesting. Wonder if they have it in browns too. Aww thanks. That’s so sweet! How good are their brushes? I’d say they’re pretty decent as a travel set. I prefer the Sculpt and Blend brush collection more. BH Cosmetics I have not tried yet. This is a great deal on all these products. I am going to have to get these for sure for this price. Thanks for sharing this awesome deal on these great products. I haven’t heard of this brand before, but those deals – yasss! I am going to have to try it out. amazing cosmetic brand and these are super cool deals, every one wants to look good and there is no better way to do that than to hurry up and get these from BH. good stuff. I love your beauty haul and all of them look like great product. I am a sucker for eyeshadows myself and I love the color of yours. I need to get another set of makeup brushes. This post reminded me. lol. I love love LOVE the turquoise eyeshadow color in the shadow palette. I have at least three outfits I could wear that with. I know the feeling, it happens to me a lot. Even when I try cutting down on makeup I still end up buying more. I’m running out of vanity space.